towards Loch Etive, which it enters near Bonawe. below which the Pass of Brander follows the line of the river to the north-west and the coast. This is one of the greatest of all Scotland’s many majestic mountains and its twin peaks make it distinctive but a cluster of lovely little islands at this end of the loch draws the eye away from the splendid mountain. MacNaughtons who had a castle at Innisfroach. On Inishail island are the ruins of a convent and chapel and the remains of a Celtic graveyard. Cohn Campbell, Lord of Lochow in about 1440. 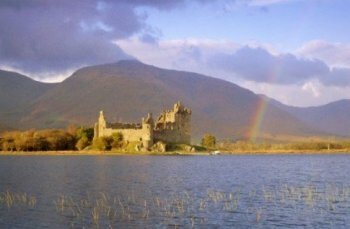 As a fortress at the time of the ‘45 it was held by Lord Bread albane with a strengthened garrison to prevent the Jacobites from passing south by this route. the 1820’s which denuded their flanks of all trees. Just two miles below the town stands a monument to the Gaelic poet Duncan Maclntyre. On the southern shore of the loch is Portsonachan, a small township now mainly a holiday centre joined by ferry to Taychreggan on the opposite bank. Just to the east of Portsonachan, Glen Aray cuts south through the mountains to Inveraray while a picturesque wood-shaded road runs along the southern shore of Loch Awe to Ford at the far end of the loch. Rob Roy lived for ten years in a house built for him in Glen Shira which runs behind the bulk of Beinn Ghlas (1,803 feet) to the east.